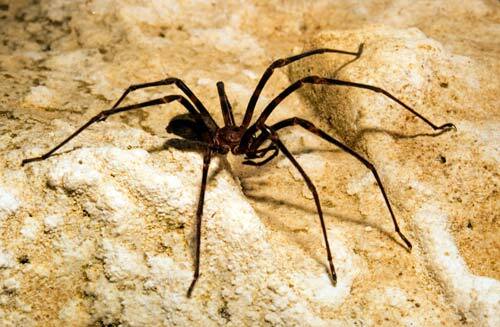 The Nelson cave spider (Spelungula cavernicola) is New Zealand’s largest native spider in terms of leg span, which can be up to 13 centimetres. The first two pairs of legs each have a long claw. The spider catches cave wētā, sitting in wait and then dropping down on them from above, while secured to the wall via a drag line which it then uses to lift the prey. This adult male was photographed in Stardraft Cave in the Ōpārara Basin of Kahurangi National Park, near Karamea.